Drywall has been used in the construction and remodeling of homes for several years. It is constructed of a layer of gypsum between two layers of pressed paper. It is then dried in a kiln and used as an interior construction material. Chinese drywall was used in homes during 2002 to 2007 during the building boom and rebuilding of homes damaged by hurricanes in several southeastern states. More than 550 million pounds of Chinese drywall were imported into the United States during this time. After the drywall was installed into homes, residents began to complain of a foul sulfur smell and reported experiencing respiratory and other help problems. Some homeowners claim the Chinese drywall caused the copper wiring and copper parts of their appliances to corrode. Much of the drywall imported from China came from the Knauf Plasterboard Tianjin Company, Limited. United States Senator Bill Nelson of Florida sent a letter to the EPA and the US Consumer Product Safety Commission (CPSC) urging them to study the toxicity of Chinese drywall used in homes. Senator Mary Landrieu and Senator Nelson introduced a bill and resolution in March 2009 encouraging the CPSC to ban and recall Chinese drywall. In November 2009 41 homes in five states in which the residents complained about the effects of Chinese drywall, and 10 control homes were studied for indoor air quality. It was found there was a “strong association” between the levels of hydrogen sulfide gas, imported drywall, and metal corrosion in the homes that had complaints. Lab comparisons showed higher levels of pyrite in Chines drywall compared to American manufactured drywall. It is believed pyrite oxidation may be the cause of the sulfur compounds being released into the air. The humid climate in the southeast adds to the oxidation and formation of Thiobacillus ferrooxidans. The Thiobacillus ferrooxidans are an iron and sulfur reducing bacterium and thought to be the cause of the respiratory and health problems some homeowners report experiencing. According to a recent article on CNN.com, the Chinese drywall must be completely removed and replaced causing substantial cost to the homeowner. In an effort to protect consumers, the Florida Department of Health has come up with a self-assessment tool to determine if Chinese drywall is present in a home. This is a valuable tool for buyers to use to see if the home they are planning to buy may contain the tainted drywall. The most common symptom is a black corrosion on copper wires, pipes, and heater or refrigerator coils. Normal corrosion is a green/blue color, but the sulfur emissions from the Chinese drywall cause it to turn black. There are three criteria a home must meet to be suspected of containing Chinese drywall. 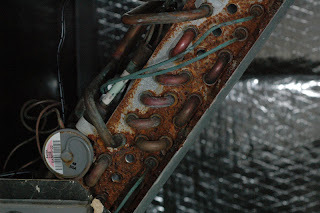 These include the age of the home, blackened corrosion of air conditioning evaporator coils or repeated air conditioner evaporator coil failure, and observed metal corrosion. When you are looking for a home in the Doral area which was built between 2002 and 2007, be sure to have your home inspector look for sulfur corrosion. There have been many reported cases of chinese drywall in Promenade and Islands at Doral. The damp Florida weather is thought to promote the release of the sulfur compounds, and the only way to fix the problem is to completely replace the affected drywall. This can run into thousands of dollars and if not replaced, your family may face serious health problems.